Debunking "The Map that Lies"
Advertisements at train stations in suburban New York depicting shrinking Palestinian territory in Israel are riling some critics who say they are “deliberately misleading and inaccurate,” FoxNews.com has learned. The ads, which were purchased by The Committee for Peace in Israel and Palestine, show the “Palestinian Loss of Land” from 1946 to 2010. An accompanying headline reads: "4.7 million Palestinians are classified by the U.N. as Refugees." Henry Clifford, co-chairman of the group, told FoxNews.com he paid $25,000 to display posters at 50 Metro-North Railroad stations for 30 days. They are to “educate and inform people” on the proper historical context of the region, he said. This map is a lie. While I presume that the white sections are indeed the land that was privately owned by Jews, the land in green was not privately owned by Arabs. Mulk: privately owned in the Western sense. Miri: Land owned by the government (originally the Ottoman crown) and suitable for agricultural use. Individuals could purchase a deed to cultivate this land and pay a tithe to the government. Ownership could be transferred only with the approval of the state. Miri rights could be transferred to heirs, and the land could be sub-let to tenants. If the owner died without an heir or the land was not cultivated for three years, the land would revert to the state. Mahlul: Uncultivated Miri lands that would revert to the state, in theory after three years. Mawat (or Mewat): So-called “dead”, unreclaimed land. It constituted about 50 to 60% of the land in Palestine. It belonged to the government. ...If the land had been cultivated with permission, it would be registered, at least under the Mandate, free of charge. To say that the green areas were "Palestinian" land is simply a lie. In the case of this version of the map, the lie is even worse, as the implication is that pre-1948 Palestine was an entirely Arab country with no Jews and no Jewish land ownership. Of course, before 1948 the word "Palestinian" more often than not referred to Palestinian Jews, not Palestinian Arabs. For example, the Palestine exhibit at the 1939 World's Fair was entirely Jewish, the Palestine Orchestra was entirely Jewish, the Palestine soccer team was almost entirely Jewish, and so forth. While this is a somewhat accurate representation of the partition plan (with the notable exception of Jerusalem, which was meant to be an international city,), it has nothing to do with land ownership. The entire purpose of this map is to make it appear that Israel has been grabbing Arab land consistently, to serve as a bridge between maps 1 and 3. What is not said, of course, is that Israel accepted the partition and the Arabs did not, so as a result Israel in 1949 looked like it does in map 3. Map 3 is still a lie, however, because in no way was the green land "Palestinian" at that time. Gaza was administered by Egypt and the West Bank annexed by Jordan. No one at the time spoke about a Palestinian Arab state on the areas controlled by Arab states - only in Israel. In other words, this progression of maps is a series of lies meant to push a bigger lie, and it is tragic that a lot of people believe them to be the truth. This map shows that Israel gave up control of the Sinai, Gaza, Southern Lebanon and much of the West Bank over the years. Rather than falsely accusing Israel as a land-grabbing rogue state, it accurately shows Israel as perhaps the only state in history that has voluntarily given up more than two-thirds of the areas it controls in exchange for nothing more than a paper agreement - or sometimes not even that. All at the risk of serious security concerns for her people, no less. This is all because Israel wants, desperately, to live in real peace with her neighbors. This desire is not reciprocated by those neighbors, unfortunately. 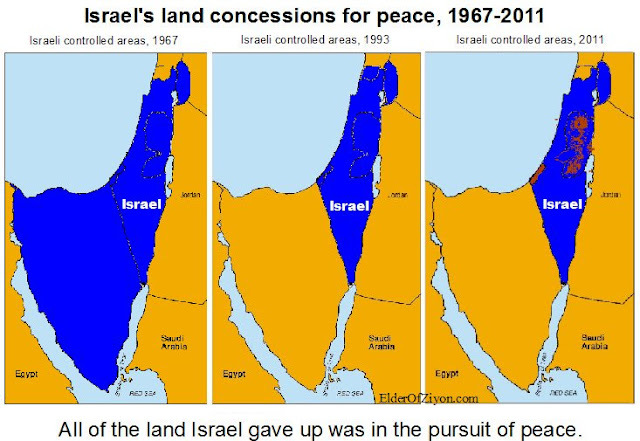 The real map shows the truth of Israel's incredible concessions in the often vain hope for peace. Now, as far as the right-hand side of the ad goes, I have debunked that as well; my most recent one was this post from less than a month ago. So, Mr. Clifford, I've shown how every pixel in your posters are historically wrong. Will you answer me, or admit the truth? Are sanctions against Iran working? Um, no. Egyptian newspaper: "Death to the Jews"
Today's "usurpers of Al Aqsa"
Egypt easing Gaza visa requirements? Not so fast. EoZ has a Wikipedia entry!